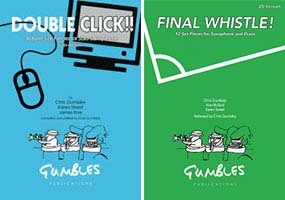 Welcome to Gumbles Publications! SAX SOLO STUDIES, SAX QUARTETS/QUINTETS, SAX CHOIRS, PIANO MUSIC AND TRANSCRIPTIONS by Chris Gumbley, Karen Street, Gilad Atzmon, James Rae & Lennon/McCartney. Here you can buy and listen to music for clarinet, sax and piano via Paypal or downloadable order form via our CATALOGUE page. To buy any of our exam books, including Streetworks, Double Click!! Sax and 15 More Crazy Jazz Studies, go to our CATALOGUE page.